Eid Mubarak! 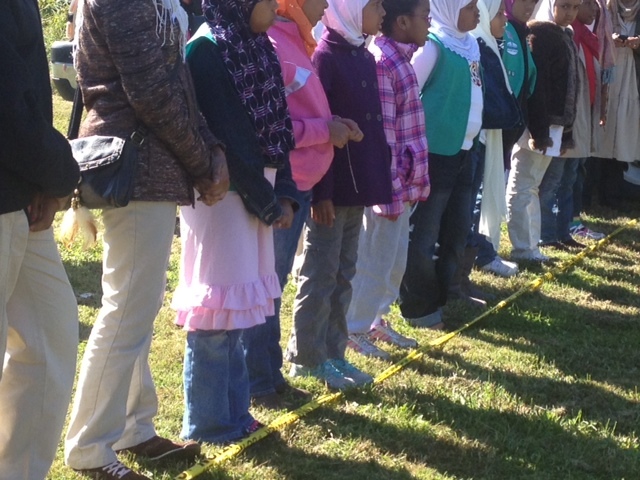 Girl Scout Troop 3480 wishes everyone a blessed and joyous Eid al Adha. May every year find us in the best of spirit and health. The next troop meeting is on Friday, October 19, 2012 at 6PM in classroom 2. Girls should be on time and in uniform. Also remember that Troop 3480 meets every other Friday at PGMA. Here’s a quick photo recap of our Archery Workshop last Saturday at the Adelphi Manor Archery Range. Kudos to Sr. Yasmine who set up an excellent program providing the girls with the Islamic perspective on archery and to Park Ranger Devin’s patient and supportive instruction. Congratulations to the participating girls who earned their archery patch. If you’ve caught the archery bug, let Sr. Yasmine know! You can also download Saracen Archery — an English version and exposition of a Mameluke work on archery from A.D. 1368. Safety First! Lining up behind the safety line. Girls learn archery vocabulary from tip to lower limb and point to nock. Ranger Devin demonstrates proper stance. Bows, arrows and arm guards await. Junior Zahra H. aims for the target. Junior Troop Leader Sr. Yasmine gives some tips. When: October 20, 2012, 10:00 a.m. – 12:00 p.m.
‘Zines are do-it-yourself mini-magazines made and used by many artists and activists as an alternative to mainstream media. Explore promotional materials in Women Who Rock, learn about the cultural effects of different media, and create your own ‘zine about yourself or a favorite topic. Presented in partnership with Girls Rock! DC. Note: This is an “On Your Own” event. This is not a Troop 3480 field trip, but rather something parents can do together with their girl scout(s). Have fun!